E-books are still a topic that manage to enrage the nation. Half are for, half are against, and most feel the price isn’t justified. But is either side right? And if you take into consideration the price of an average book, surely paying a one off fee for an e-device that comes with literally thousands free to download isn’t such a bad deal? I’ve been road testing the BeBook, and can now present to you my findings. And it’s love. It’s an amazingly lightweight (220g) portable device that slips easily into any bag, and nestles contentedly within its leather-bound cover. It can store up to 1000 books on its 512MB memory, and so far I’ve got around 300 on it. Should you go over this, there’s an SD card slot to upload even more, and you can walk around with your whole library on you- something a voracious reader like me really enjoys. Now I can flick through old classics on whim, as well as add new books whenever I desire. The screen is really easy to read as it utilizes eInk technology, which doesn’t hurt your eyes like an LED screen and can be comfortably read at any angle. You can adjust the font size with the zoom button, and there are three sizes to view it from. If you don’t like the preinstalled font you can change that easily, though I liked the one it came with. It’s easy to navigate as well. The first screen features a menu that’s spilt into categories such as Books, pictures, RSS feeds, and you can customize it to your preferences. Once in the books menu, everything is alphabetized which makes it easy to find what you’re looking for. You can then turn the page either with the side buttons (great when reading lying down) or with the buttons underneath the screen. The OK button takes you into the various menus and lets you adjust bookmarks, and set up different applications. There is a headphone jack included as you can store MP3’s on it, though I shouldn’t imagine you’d want to. You can also store JPEG’s though the quality really isn’t that good but then you’re not buying this as a digital photo frame are you? A three hour charge (via USB) will give to enough power for approx 5000 page turns. They say that it can last 7000 but mine seems to die a little earlier than that. This is one area the BeBook really excels in as it reads around 25 formats. I’ve opened lit files, JPEG’s PDF’s and txt files with absolutely no problem and have placed RSS feeds on it by syncing it up via USB to MobiPocket. I’m impressed it supports the DRM protected formats such as Microsoft Lit and Mobipocket as that places it heads and shoulders above its competitor, the Reader- which I’ll get too soon. I like how the BeBook site includes an online library that’s free to download, even though the books are a selection of old classics. But hey, it’s never too late to brush up on your Austen right? They’ve also handily provided links to free eBooks online and commercial retailers and I bought a Pratchett book from eBooks online. It cost $6.99 and was easy to download, as the BeBook works on a drag and drop system, and you simply choose the format you want to download. I was impressed with the pricing, and the library available, and as most eBook retailers are US based, we Brits can get a fair amount for our pound. 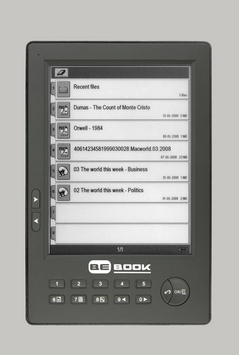 The MobiPocket option means that you can set up the BeBook to upload your favourite RSS feeds when connected to your computer (no wireless at this time) and then read them on the go. You will have to install MobiPocket software and stream it that way, which can be annoying, as I found I had to manually upload each feed, but once on the BeBook it was easy to read. Images didn’t seem to come through the RSS stream, but I’m not sure if that was the computers fault or my settings. There had to be some, huh? The problem with this eBook and every other one on the market is the screen refresh time. True, it’s less than 2 seconds, but it does hinder the reading experience. Despite this I’ve so far managed to read around 20 books on my BeBook, so it’s copable, it’s just a tad annoying and difficult to get used too. You also can’t read it in the bath (one of my favourite reading spots) which is understandable- but a shame. It would also be nice if there was a wall charger as when you travel you don’t necessarily have a laptop with you to charge it. The Sony Reader needs to be mentioned as it’s the main player on the UK eBook market. So how does it compare? Well it’s certainly more stylish to look at and has 12 shades of eInk compared to the BeBook’s 4. On the downside, it’s heavier, bigger and books are locked to DRM. That’s probably the crucial factor at the moment and why the BeBook is worth the extra £30. I love my BeBook, and will never go a day without it. It’s great on holiday, on the tube, and in bed. All I could want from anything really.. if it only cooked me dinner I’d marry it in a second! I think the option in ereaders like the Bebook and Foxit eSlick (I don’t know about the others) is good because it allows us to listen to podcasts, rather than music. I am a bigger reader than music listener, therefore buying an ipod is hard to justify just for music and podcasts – but an ereader and podcasts and some music is much easier to justify. I recently bought a BeBook and I think it’s well worth the money. I would definitely recommend it as the best ebook reader on the market currently. The huge range of formats it supports puts it way out in front of the rest. Once you get used to the layout it is very easy to use as well. Finally, the guys at Endless Ideas are very responsive to customer feedback and are very quick to release firmware upgrades to improve the BeBook. I think it can only keep getting even better from here. 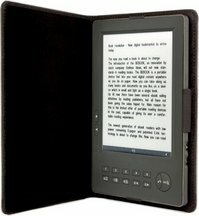 If you are thinking of purchasing a BeBook from the mybebook.com website then feel free to use my email address in the discount coupon section to receive a 25 Euro discount. This helps me too so it’s a win-win situation.